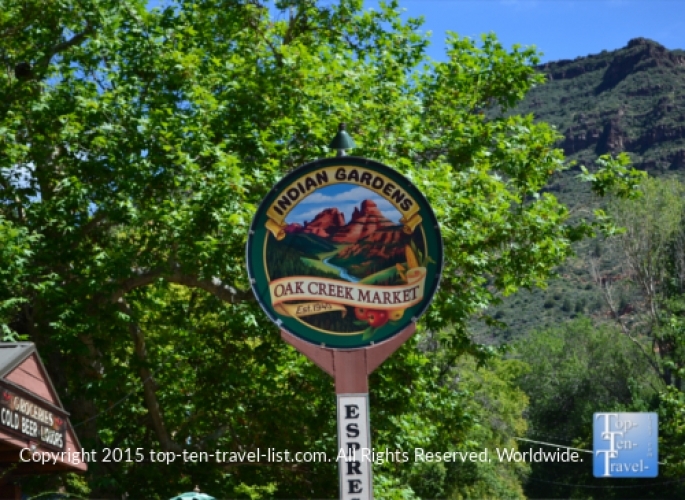 While making the journey along gorgeous Oak Creek Canyon drive, you will come across a cute little cafe and market known as Indian Gardens. This peaceful breakfast and lunch oasis gives you the opportunity to stretch your legs and take a break from driving while you enjoy great food, fantastic espresso drinks, and a beautiful garden patio. At Indian Gardens, you will find a full coffee bar complete with cappuccino, mocha, espresso, and latte drinks. 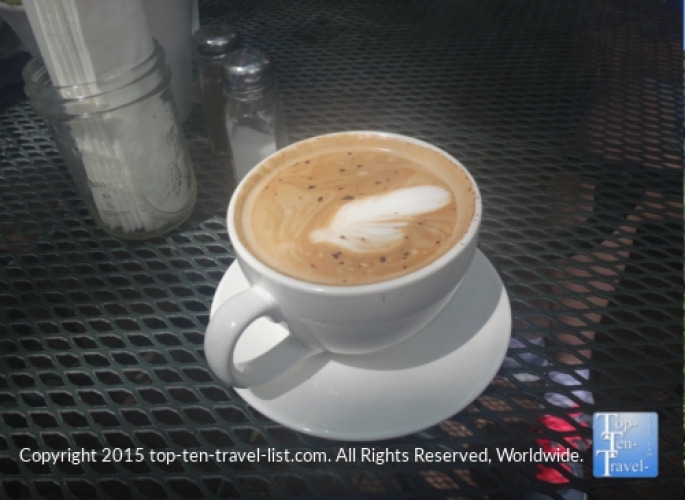 In addition, everyday a selection of single origin coffee drinks are available. The mocha, available with dairy or a dairy-free alternative, was creamy and delicious: a perfect treat! For non coffee drinkers, a selection of organic teas from Mountain Rose Herbs is available. The breakfast menu is pretty limited, although you will find most of the usual selections like an eggs your way plate with potatoes and toast (very good! ), breakfast sandwiches and burritos, and smoothies for those with a sweet tooth. 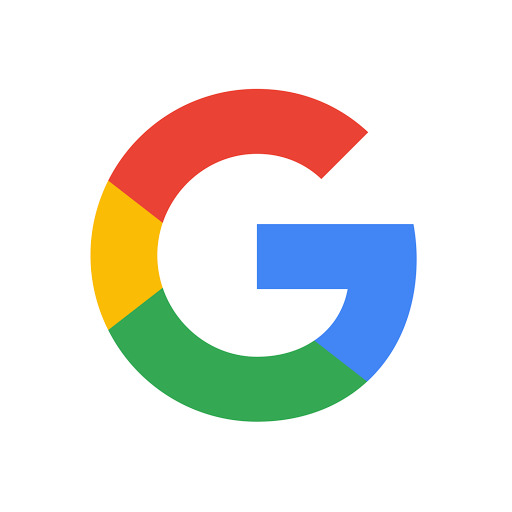 Vegetarian and gluten-free selections are clearly marked and the staff has no problems with substitutions including gluten-free toast with breakfast and bread for the lunch sandwiches. 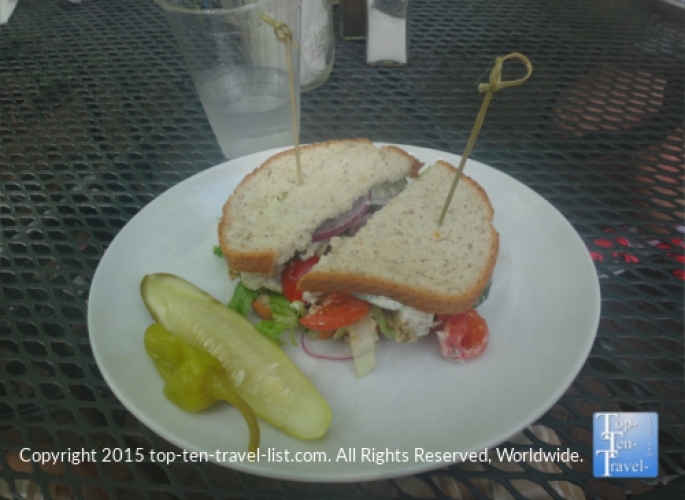 For lunch, you will have your pick amongst a small variety of sandwiches, salads, and soups. The Garden Pita, available vegan and gluten-free with a few small substitutions, is a wonderful, filling choice before spending the afternoon in Sedona's great outdoors. A combination of veggies (carrots, cucumbers, tomatoes, red onions, spinach, and alfalfa sprouts), healthy fats (avocado), feta cheese, and hummus, served on a spinach wrap or on toasted gluten-free bread, was a great pre-hike meal as it did not leave me with an overstuffed feeling. As a suggestion, serving a few chips alongside the sandwich as opposed to just pickles, would be a great future improvement. The soup of the day was a fantastic dairy-free Butternut Squash, a reminder of the beautiful fall season to come! 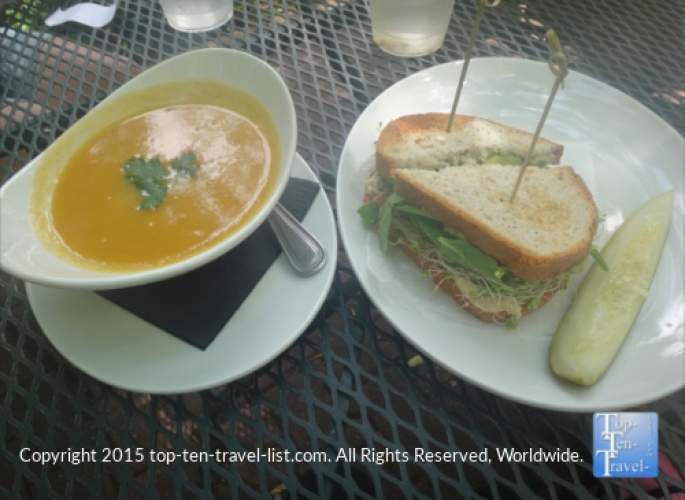 The creamy butternut squash/apple flavors complimented the veggie sandwich perfectly. For meat eaters out there, our table really enjoyed the Chicken Pita, a combination of chicken breast, hummus, and veggies with a red wine vinaigrette. If you are craving a sweet after your meal, check the tempting display counter for today's selection of treats and pastries. Also be sure to try out a piece of organic dark chocolate candy, made locally by Chocolatree Organic Oasis, a popular gluten-free cafe and chocolatier. Indian Gardens is sure to please anyone enjoying the Oak Creek Canyon scenic drive. 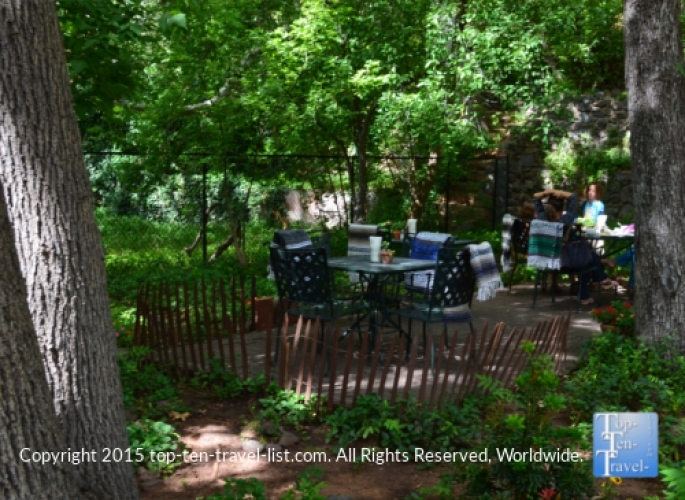 The relaxing garden dining area perfectly compliments your lazy drive and relaxing day in Sedona exploring nature. Conveniently located right off the road with great food and great views, there really is no excuse not to try out Indian Gardens.